Electric car benefits are great enough now (after 100+ years of history and development) that I think most car owners would be better off with an electric car. But transitions take time and can be quickened with good incentives. As we inch into the electric vehicle revolution, some cities and countries are clearly doing more than others. While it makes sense for basically all cities to incentive zero-emission transport that will keep their air cleaner, their citizens healthier, and their climate more livable, only a handful have strong foresight around this matter right now. In this article, I want to highlight some of the strong leaders. 1) Oslo, Norway, has to be considered #1. Part of its success is due to policies of the broader government and general consumer awareness. Well above any other country in the world, about 25% of new car sales in Norway are now electric car sales. But Oslo is certainly a big part of that success. It offers electric car drivers access to bus lanes, access to HOV lanes, free parking, free ferries, free toll bridge access, and free electric vehicle charging options. That’s a lot, and it is paying off. 2) Amsterdam, the Netherlands, is another European city offering a good home for an electric car owner. Again, national financial incentives are a big help, but the city is also doing its part. If you have an electric car and park on the street but don’t have a charger in your neighborhood, or don’t have enough of them, you can request one from the city and it will install it on your street in a relatively short period of time. With charging stations all around the city, you can use a single card that you simply hold in front of the machine to initiate a charging session. Amsterdam also offers extra financial incentives for electric taxis and vans (€5,000). The city was also the first in Europe to bring in the electric Car2Go carsharing program. And then Amsterdam also benefits from Fastned, which has its headquarters there. 3) San Francisco, USA, also has to be in this list. Again, broader regional support is a big part of San Francisco’s success, with residents benefiting from the $7,500 US federal tax credit for EVs and the $2,500 ZEV rebate from California. 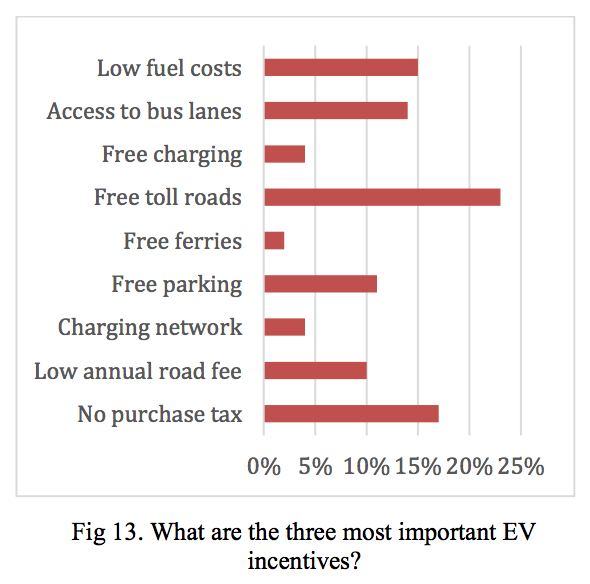 But San Francisco piles it on with its own incentives, such as HOV lane access, a large number of charging stations, some free EV charging, a home EV charger subsidy, public education campaigns, an EV readiness requirement in its building code, a workplace charging program, a city electric carsharing program, and other things. 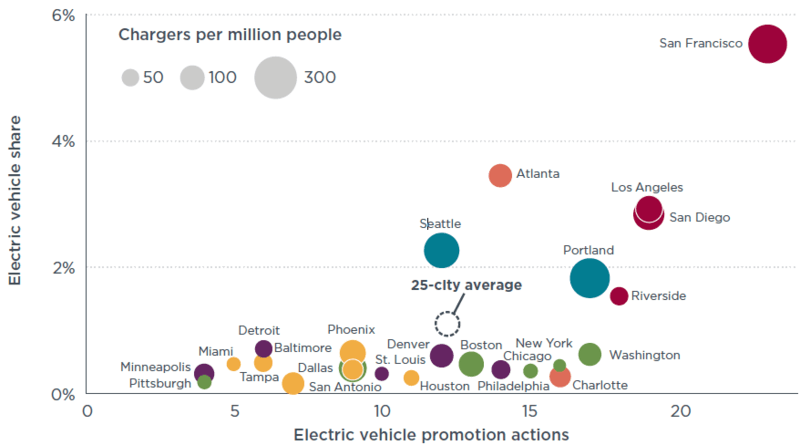 It tops large US cities in EV adoption and support in a number of ways. 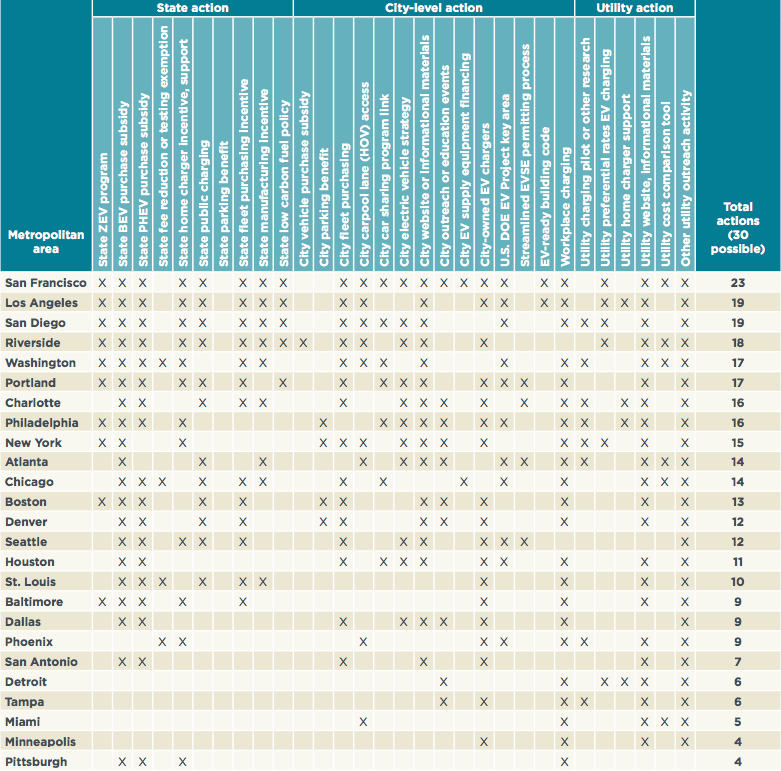 Thanks to these great cities for leading the way into the electric vehicle future. Let’s hope others follow their lead sooner rather than later. ← How Fast Are Solar Prices Dropping? Stupid people! Don’t even know they would be better off with electric cars. While we are at it, let’s incentivize organic food. Better eating is important right? We can’t wait for people to decide for themselves. Besides, what happens if they decide against electric cars and organic food? Stupid people! We can’t wait … Dictate !! People are hugely unaware of electric cars, haven’t experienced them, and thus haven’t realized how much better they are. since 2012 I’m joining EV rallies, presentations and information weeks and I have to say that today much more people know about electric cars but even it is more and I’m feeling a change between 80edays 2012, where people in California asked me what kind of brand my Tesla Roadster was to 80edays 2016 where people in Kazachstan stated “oh a Tesla!” it’s a homeopathic dosis till now. Even if the Model 3 is sold one million times most of the people simply won’t know about it and will look surprised when they hear that they are parking on an EV charge station spot. Assuming that till 2020 we will see the first Tesla promotions in the TV and also more from other EV manufacturers I’m curious of the reaction in 2020 when the third episode of the around the world rally in electric cars named ZERO will start with 20 international teams: http://www.80edays.com. I won’t stop electrifying people and supporting projects like sailing cargo ship building till every single human being will know about it and will know that there is an alternative. Zachary-Behavior modification is the key. Even the chain smoking jet setter is pro environment while relaxing in his fabulous eight bathroom house with an attached six car garage. Plus, there is money to be made in religious endeavors. Just ask Al Gore. The. poverty level individual rarely speculates on air pollution and dietary correctness, while the wealthy can build gated communities and preach to the rest of the world.